What emotions contribute to risky driving? 2 What is risky driving? 4 How can emotions affect our driving ability? There are different emotions that make up our mood and how we feel every day. For example, emotions can make us feel happy, sad, upset, and angry. However, driving requires focus and the ability to make smart and safe decisions, and occasionally make quick decisions, a process which emotions can interfere with. This chapter examines what emotions contribute to risky driving. It will look at how an emotion can be defined by addressing different theories of emotions and focus on how these emotions contribute to risky driving and influences that are involved. There is a case study from the police and the statistics they have found on emotions contributing to risky driving behaviours that end in car crashes. Risky driving is when the driver shows behaviours that increase the risk of having a crash. This will also aim to define what is risky driving and if there are driver categories that help explain this. How can we define them? How do emotions contribute to risky driving? Figure 2. High levels of emotion can lead to dangerous crashes on the road. Risky/distracted driving can be defined as behaviours that don't follow set road rules and which have the potential to increase the risk of a crash or increasing the danger to yourself or someone (Jeon, 2014). To be in danger, you can not be adhering to the road rules, not concentrating, or you have taken substances that impact on your ability to drive safely. These are some factors that are dangerous, leading to a risky driving classification (Jeon, 2014). Risky driving can be anyone at anytime, even if there was a thought that you were a safe driver (Jeon, 2014). There is no set definition of what is safe and what isn't. But a basic understanding of safe driving is someone who is able to follow the rules (stay at speed, not drift in lanes), drive without other factors such as consumption of alcohol - being protected from unnecessary variables that can place someone in extra danger (Jeon, 2014). This is a brief definition of what it means to be safe, with there being more than one as there is a variety of different variables in explaining this (Jeon, 2014). To define a risky driver research has shown that it can be broken down to speeding, taking a corner too quickly, not indicating, not breaking soon enough (Evans, 1983) as well as many other factors. It is not necessary to adopt this behaviour continuously to be classified as a risky driver. These actions can occur just once, and for a short time and you are then seen as a risky driver for that time frame (Evans, 1983). There are many different results that can occur from the actions of risky driving. These can be as bad as a person dying or there being slight vehicle damage. They can all be factors from risky driving to just bad luck. Risky driving often does not have a good outcome and it is often suggested that you need to think about the outcome before you are act. Emotions are what people feel every day and what makes up part of their mood. It is a mood that humans give a name to that allows them to describe their feelings. It is difficult to find a set definition that has theory to support what an emotion is. "Many psychological scientists and behavioural neurosciences affirm that "emotion" influences thinking, decision-making, actions, social relationships, well-being, and physical and mental health. Yet there is no consensus on a definition of the word "emotion," and the present data suggest that it cannot be defined as a unitary concept. Theorists and researchers attribute quite different yet heuristic meanings to “emotion.” (Izard, 2010). There are four theories that are being looked at [awkward expression?] to help gain a greater understanding on emotions and they will be Robert Pultchik[spelling?] theory, Darwin and Facial Expression, The James-Lange Theory of Emotion and the Cognitive Theory of Emotion. By breaking down and understanding these theories there is the goal to understand how individuals are able to process their though[spelling?] and manage their emotions. Once there is an understanding then the practical understanding of how they relate to risky driving can be further understood. Figure 3. Robert Plutchik Theory Visual representation of emotions. These emotions are basic emotions that are easy to understand as well as being easily expanded into more detailed emotions with more than one meaning (Plutchik, 1980). The basic emotions are there to help explain our emotions to survive day to day with a single function they were linked to. This theory was considered to be classified as psycho-physiological process that showed our behaviour made us perform our actions based on emotions (Plutchik, 1980). As seen in Figure 3 there are more than eight listed emotions,[grammar?] this is aiming to demonstrate that there are more than these listed and how a meaning of an emotion can be expanded and he considered theses to be our advanced emotions (Plutchik, 1980). His main proposal was explain by dyads – two elements to explain a single thing. These dyads consisted of a basic emotion and an advanced emotion that linked in to Plutchik wheel of emotions (Plutchik, 1980). From this example [grammar?] it demonstrated that a combination of emotions has the ability to form their own emotions outside the basic eight. This wheel was also able to demonstrate that combining two basic emotions you get a new one and then combining one a basic and advanced emotion there are again different emotions that are shown. This theory has allowed for a greater understanding as to how emotions are formed and how they are able to consist of many to make a single emotion. Figure 4. Usage of different facial expressions. 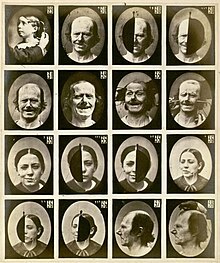 The Darwin and Facial expression was able to develop and understanding of how people can show what they are feeling without the usage of words see figure 4 (Ekman, 2006). This is because our facial expressions are a visual representation of how we feel. This is useful to know as emotions are not always easy to express so by understanding this there is the ability to acknowledge how people feel without words. There is also the understanding that emotions develop at different times (Ekman, 2006). The James-Lange theory of emotions is looking at discovering how our emotions work in reaction to what our body is doing. The James-Lange Theory addresses the physiological reactions to events (Cannon, 1927). This theory can be seen in the driving of someone stopping suddenly and then they are frightened so they take off quickly, increasing their driving to be risky behaviours as their body is frightened because of the sudden stop (Cannon, 1927). Figure 4 shows different facial expressions and the ways we perceive them are all different, demonstrating our perception of an individual’s emotions is always changing. "A theory is proposed that emotions are cognitively based states which co-ordinate quasi-autonomous processes in the nervous system. Emotions provide a biological solution to certain problems of transition between plans, in systems with multiple goals. Their function is to accomplish and maintain these transitions, and to communicate them to ourselves and others. Transitions occur at significant junctures of plans when the evaluation of success in a plan changes. Complex emotions are derived from a small number of basic emotions and arise at junctures of social plans." (Oatley, 2008). This theory is able to help explain the first step in how emotions are formed starting with physiological arousal followed but the identification oh the reasoning of this arousal the allow the emotion that is being formed to be considered an emotion (Oatley, 2008). How many emotion are in Robert Plutchik Theory? Is facial expression connected to emotions?. What did Darwin's [what?] theory focus on? How can emotions affect our driving ability? Emotions can affect our driving in a variety of different ways such as decreasing the ability to concentrate, altering our reaction ability, also past emotional connection to a dangerous situation from previous driving, and emotional attachment to other factors when driving, such as presence of a mobile phone (Jeon, 2014). A lack of concentration when driving impairs the decision making process that needs rational thinking and different emotions to be present. Based on the understanding of what emotions are there are many different emotions that people have and their reactions are different. This means their reactions to situations when driving cannot be predicted (Jeon, 2014). This then provided evidence that there is no set way that our emotions effect our driving other than evidence saying the more negative the mood, the more likely driving behaviours will be risky (Jeon, 2014). When feeling down and not happy when driving it is more likely that road rules will be broken, increasing the risky driving factor[factual?]. Research shows that there is a link to previous car crashes and the emotions you experience when driving (Evans, 1983). It was found that there was a link to feeling nervous when having to drive after being in a car crash. This makes you have higher levels of emotions affecting the driving ability to focus completely at the task (Evans, 1983). Research is allowing more understanding into how emotions are effecting out driving and from a combination of studies there was a mixed review of what information contributes to this driving behaviour[vague]. This allows for further understanding as to what is contributing to risky driving. In a study done by Ulleberg in 2003 it was looking at Personality, attitudes and risk perception as predictors of risky driving behaviour among young drivers (Ulleberg, 2003). This study had the aim to understand differences in personality towards the attitudes leading to risky driving. It targeted traffic accidents to gather its data (Ulleberg, 2003). It was looking at different personality measures such as aggression, altruism, anxiety and normlessness (Ulleberg, 2003) to understand how there they are contributing emotions that cause an increase in crashes (Ulleberg, 2003). Further studies were able to support this finding of personality influences affected behaviours that increased risky driving (Chen, 2009). The findings from these researches[spelling?] was able to suggest that different personality types contributed to the level of risky driving and more aggressive traits were present in some personalities that were more outgoing (Ulleberg, 2003; Chen, 2009). Further investigation into the understanding of personality and emotions it was found that crashes were not linked to the personality and level of risk taking, but there was a strong correlation between different personalities and willingness to take risk – with more outgoing people willing to create a risker[spelling?] environment (Tao, 2017)[Rewrite to improve clarity]. Aggressive behaviour is more common than expected with a larger number of people agreeing to be aggressive when driving (Jovanović, Lipovac, Stanojević, 2011 & Stephens, Trawley, Madigan, Groeger, 2013)[awkward expression?]. This is not linked to just on[spelling?] country but rather a worldwide issue (Jovanović, Lipovac, & Stanojević, 2011). When looking at personality traits it was decided to focus on a five factor one that was able to include aggression so there was a combined understanding (Jovanović, Lipovac, Stanojević, 2011)[awkward expression?]. The aim of this study The effects of personality traits on driving-related anger and aggressive behaviour in traffic among Serbian drivers (Jovanović, Lipovac, Stanojević, 2011) was to look at neuroticism and introverted and extroverted personality and see what was a larger contributing factor to risk driving behaviour based on aggression (Jovanović, Lipovac, Stanojević, 2011). It was shown that neuroticism, agreeableness and conscientiousness predicted driving-related anger and aggression (Jovanović, Lipovac, Stanojević, 2011) are all linking to higher aggressive behaviour (Jovanović, Lipovac, Stanojević, 2011). Figure 6: A diagram of the Theory of Planned Behavior. The [[wikipedia:Theory_of_planned_behavior|Theory of Planed[spelling?] Behaviour]] (TPB) is defined as behaviours we demonstrate come from our thoughts or beliefs see figure 6 (Ajzen, 1985; Ajzen, 1991; Elliott, Armitage, Baughan, 2003)[Rewrite to improve clarity]. This is related to how we form our actions and can be linked to why our emotions get ahead of us when risky driving is shown or thought of (Ajzen, 1985; Conner, Smith, McMillan, 2003)[awkward expression?]. A research paper was able to understand that when you are being pressured into doing an action your emotions have the ability to get the better of you and this can translate into the task of driving (Conner, Smith, McMillan, 2003)[Rewrite to improve clarity]. This[what?] can be linked to our emotions and how we act and partake in risky driving. Research has linked it to having other passengers in the car encouraging you to take a corner faster than recommended so you do (Conner, Smith, McMillan, 2003)[awkward expression?]. TPB then asses[spelling?] this as norms then then[grammar?] intention is changed as your emotions are taking over what you want to do due to there being peer pressure so you then drive to[spelling?] fast around the corner. This is then showing how risky driving is affected by emotions[awkward expression?]. Can risks be related to feelings of emotions? In a research paper it aimed to address these connections (Loewenstein, Weber, Hsee, Welch, 2001). This research was able to to look [missing something?] how the cognitive process would show similarities between these two - risk and feelings (Loewenstein, Weber, Hsee, Welch, 2001). The main research finding from this was able to conclude that risk was a feeling that fell under our emotions and displayed there was a link between how moods are reflected on our willingness to take a risk and how we measured danger as an individual (Loewenstein, Weber, Hsee, Welch, 2001 & Dula, Ballard, 2003)[Rewrite to improve clarity]. There is a growing amount of research linked individuals[grammar?] identity being impacted as to what is on their phone and its location without taken[grammar?] into consideration their actions or what the current task around them, even with it being driving (Pain, Grundy, Gill, Towner, Sparks, Hughes, 2005; Walsh, White, Young, 2010). Recent study[grammar?] are investigating how technology has changed and how there is a[grammar?] increase in the support of evidence supporting how a mobile phone are becoming more integrated in different individuals[grammar?] day to day life (Pain, Grundy, Gill, Towner, Sparks, Hughes, 2005). This can explain how risky phone usage is becoming more apparent when driving, as there is an emotional relation to the device (Walsh, White, Young, 2010). With the increased information that is readily available on phone, it is understood that if information is required when driving there is the idea that it's OK to check as this is part of an action that is becoming a normal behaviour and emotion (Pain, Grundy, Gill, Towner, Sparks, Hughes, 2005; Walsh, White, Young, 2010). By this connection to having a positive attitude to connecting with a phone there is an increase to risky driving as there is a greater distraction with the possibility of causing damage to yourself or people around. Figure 7: How the brain looks with its sections labeled. Evidence suggests that younger people take more risks than that of older people (Rhodes, 2011). It can be assumed that it is due to the frontal lobe still developing and therefore having emotions still developing (Rhodes, 2011). This is then influencing the driving ability and how emotions are presented. The evidence suggests younger people take more risks as they are willing to not let their emotions get in there way of "having fun" without assessing the consequences, this happens when driving as well (Rhodes, 2011). From this understand[grammar?] the brain development plays a part in the emotions that are linked to risky driving (Jonah, 1990 & Rhodes, 2011). This is then able to show when emotions are not fully developed or understood the behaviours are different with more risks being taken, indicating that a combination of the brain developing emotions that are surrounding adrenaline activities are related to risky driving (Jonah, 1990 & Rhodes, 2011). One recent study was assessing whether middle aged drivers be classified as riskier drivers because of the linkage to their most common emotion being frustration and also being in a hurry (Jonah, 1990 & Rhodes, 2011). Research looking into the driving pattern found that if these middle aged drives were in a hurry they would take risks when driving so they could get to their desired location on time (Jonah, 1990 & Rhodes, 2011). This chapter has explored what an emotion is and how it can be classified though the explanation of different psychological theories. There are four theories of emotion that were discussed; Robert Pultchik theory, Darwin and Facial Expression, The James-Lange Theory of Emotion and the Cognitive Theory of Emotion. These four theories were able to help gain an understanding of what emotions are and how they can be understood by different people. Each one of these theories (and their explanation) are different. This gave an insight into understanding how individuals feel and how emotions are formed. By defining risky driving it is able to provide a brief understanding about the risk factor associated with this[vague]. There are a variety of emotions that effect our driving and research was able to concluded[grammar?] that when upset there was a lack of concentration that impairs decision making on the roads, along with different emotions make individuals react differently altering their driving judgement. The research was able to show previous accidents make you more susceptible to higher emotions leading to your being driving affected[grammar?]. Finally the younger the drivers are more riskier than what would be class[grammar?] older drivers but evidence has suggested that middle aged drivers be classified as riskier drivers in newer research. There are many emotions that contribute to how we act, think and go about our actions day to day, but when driving the negative emotions that consist of making us upset or prevent us from concentrating have a large impact on our driving ability and increases our behaviours towards risky driving. Conner, M., Smith, N., McMillan, B. (2003). Examining normative pressure in the theory of planned behaviour: Impact of gender and passengers on intentions to break the speed limit. Current Psychology, 22(3), 252-263. Ekman, P. (2006). Darwin and Facial Expression. San Francisco, California: Academic Press. Plutchik, R., Kellerman, H. (1980) Emotion Theories, research and experience - Theores of emotions. New York, Academic Press. Police warn against driving while emotional, after mother and daughter killed in car crash. (2017, August 11). Retrieved from ABC News website: http://www.abc.net.au/news/2017-08-10/police-warn-against-driving-while-emotional-in-cranbourne/8794576. 9 Different Types of Divers You Find On The Road. (2016, July 25). Retrieved from Odyssey website: https://www.theodysseyonline.com/9-different-types-drivers-you-find-the-road. This page was last edited on 26 July 2018, at 02:44.